Stocks dipped in early trade, but rallied back to breakeven by the close. We stopped just shy of resistance at 1,810 as buyers were unwilling to chase the market higher for a second day. Depending on your point of view, either the market took a break following yesterday’s impressive rally, or it stalled as demand dried up. In this afternoon’s post, I discussed who is sitting out of this market and what it will take to get them back in. Tonight, I will look at who is already in the market. Momentum traders are on board this rally. They learned months ago it is futile second guess this strength since they regretted every dip they sold because it quickly rebounded to new highs. Last week they said markets will continue higher because of QE. Now they say we don’t need QE to keep on going. At this point they just invent reasons to keep holding. Paranoid traders who avoided this market because of Fiscal Cliff, Sequester, Obamacare, Contagion, Shut Down, Debt Ceiling, etc no longer have an excuse to not own this market. Now Taper’s come and gone, there is nothing to fear except being left behind. It is easy to forget about the buy and hold crowd since they never trade. They don’t buy much and sell even less, making them mostly a ghost when trying to anticipate near-term market moves. Most shorts bought with both hands yesterday as they were forced to cover on the strong rebound. All that are left is the most stubborn shorts who are unlikely to buy back their shorts no matter how high this goes. An entire herd of former bears are now enthusiastic bulls. These traders blow with the wind and are the ones who helped us go from 20% bulls a few months ago to nearly 70% now. As they changed their mind, their buying fueled this rally to all-time highs. But the remaining 20% bears are a stubborn bunch and we have better shot at getting Bozo the Clown elected president than persuading any of these hardened bears to join the party. While I respect yesterday’s extremely bullish reversal, I have a hard time getting excited about a market with so few buyers left to keep pushing this rock uphill. Call me stubborn, early, wrong, or better yet all three, but I simply cannot embracing the market here. I’ve been a raging bull since the bottom back in November 2012, but there just comes a point when expecting continued strength doesn’t make sense any more. While the largely meaningless trade of the next couple weeks is unlikely to move the market far, things will get interesting in January, especially once some of the early adopters of this rally pass the 12-month mark and can start locking in long-term capital gains. These things go longer and further than anyone expects. That is clearly the case for this rally that most called a dead cat bounce back in January. While the ranks of bears and cynics thins by the day, their capitulation buying is what keeps this rally alive. We are coming into year-end and volume will drop dramatically next week. Low volume allows smaller trades to have a larger impact on prices and we should expect increased volatility. Maybe we run up, maybe we come down, or maybe we just chop around, but without the big players the market behaves far less predictably. Buy and hold can sit through it, but the rest of us should consider taking some time off. Stocks took a breather this morning following yesterday’s rebound to new highs. Previous buying stalled at 1,810 and breaking through this barrier will show this rally is ready to continue. Failing to add to recent gains likely means we will remain within the recent 1,780 to 1,810 trading range into year-end as neither bulls nor bears have the strength to move the market. Yesterday was fueled in part by a large wave of short-covering as bears were forced to buy the unexpected bounce to new highs. 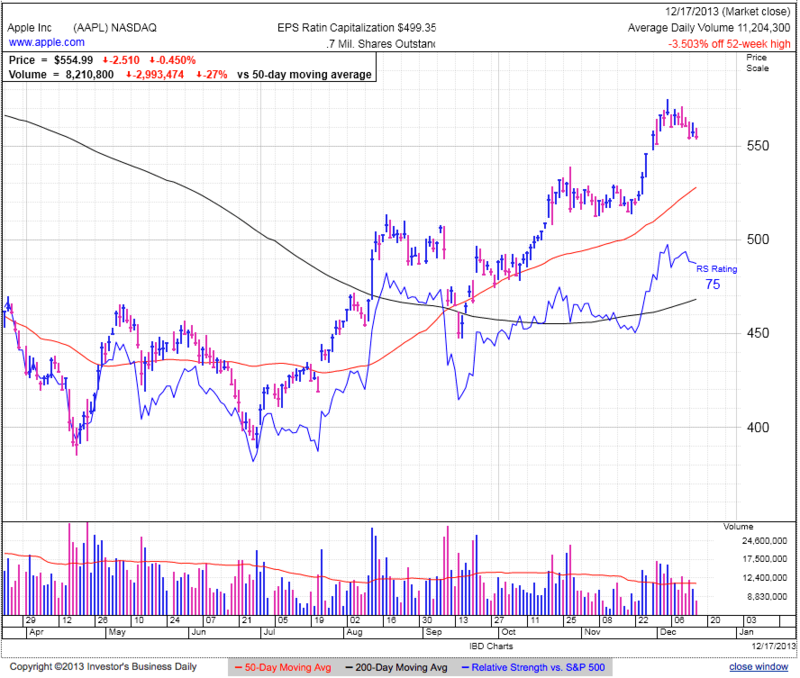 This strong move also won over many standing on the sidelines because they feared a Taper driven selloff. With a budget deal in the works and Taper uncertainty behind us, there is no reason left to not own stocks and why the crowd feels so good right now. But the more comfortable the crowd is, the more nervous we should be. Quirks arising from supply and demand lead to “irrational” market behavior. Yesterday saw a huge surge on Taper because no one wanted to sell and buyers were forced to pay a premium to coax owners to sell. We can say this or that about a fundamental justifications for yesterday’s move, but the simple fact is owners didn’t want to sell and that scarcity drove prices higher. The initial surge was fueled by short covering and late to the rally buyers, but to keep going the market needs new money to continue buying. As long as we find a next greater fool willing to buy at even higher prices, all is well. And that is the big debate. When fears and uncertainties are few and far between, who does not already own stocks? We have the chronic worrywarts hiding in bonds. If they are still reluctant to trust stocks after the market ran up nearly 300% over the last four years, I seriously doubt a two-page policy statement from the Fed will cause them rush into the market with reckless abandon. Swing traders buy weakness and sell strength. They are more likely to sell yesterday’s bounce than buy at all time highs. Value investors are notoriously thrifty and largely avoid buying near all time highs, preferring to wait for more attractive discounts. These buyers have tons of money, but even more patience. They are more likely to buy the dip than chase a breakout. With so few buyers left willing to chase all-time highs, we need to be concerned about demand. Confident owners and tight supply can mask demand problems for extended periods of time, but there comes a point when even tight supply cannot prop up the market. The market bounced when it should have sold off. That is always noteworthy. But we also need to be cautious of recent volatility since that is a common component of topping patterns. Obviously there are plenty of people who keep buying this market near all time highs, but with so few excuses to avoid stocks, we are getting close to the point of running out of new buyers. While we are not there yet, we are getting closer to the dip that won’t bounce. Until then keep holding, but stand close to the exit. The last time the Fed really surprised us was September 18th when it didn’t taper. The market surged 1.2% to all-time highs on the news, yet that marked the top as we slid into the Shutdown/Debt Ceiling lows. While we don’t have a clearly identified hurdle in front of us, the market is vulnerable to any negative headline. With the Taper officially started, bad news is bad again. Barring an imminent collapse, the market will likely trade flat or modestly higher through the holidays and into the end of the year. Traders can move to cash and take much deserved time off while others can continue hold through the holidays. January is the next time the market will fall under the microscope. Until then its flaws will remain hidden. 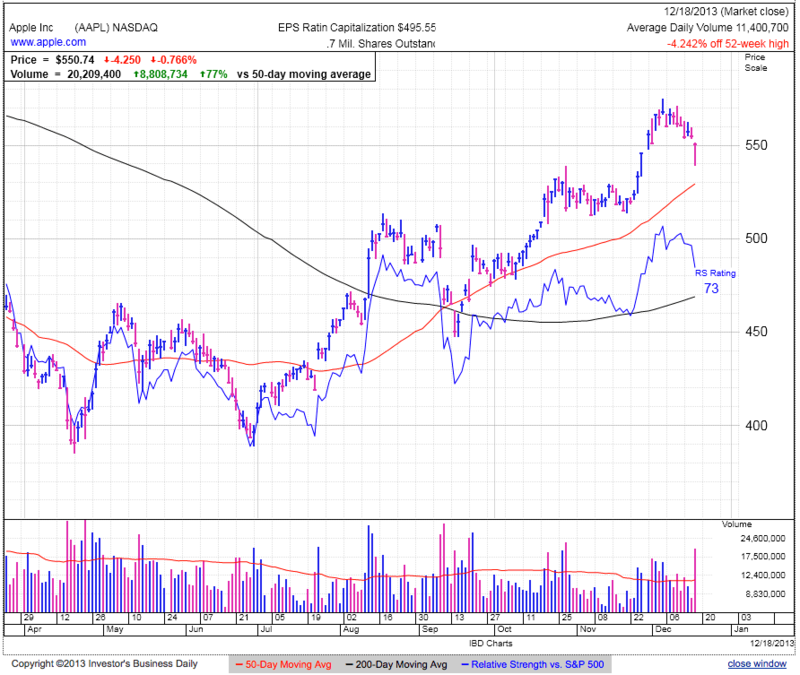 While the market is acting strong, AAPL and TSLA are not having the same success. TSLA is being rejected by the 50dma and AAPL is failing to hold $550. Stocks go up and stocks go down. 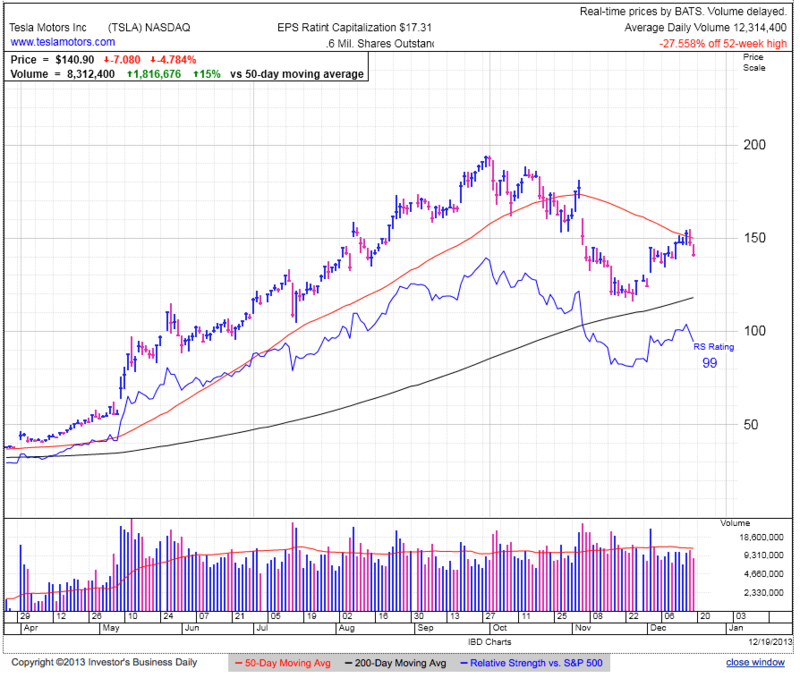 While both of these stocks might be consolidating recent gains and setting the stage for a continuation higher, owners need to have a plan on when they will take profits. Huge intraday reversal following the Fed’s policy statement that formally launched Tapering, yet pledged to keep interest rates low for years to come. The day’s range was well over 40-points on 30% above average volume. Following the initial Taper surge, prices continued ramping into the close as bears were scrambling to buy back their shorts. The market loves to surprise us. Few expected a strong performance following a Taper announcement. In May we tanked in the year’s biggest sell off on a hint of Taper. In September we surged when the Fed surprised us by not Tapering. But today we ramped up even more on the announcement of Taper. The two most likely explanations are the promise of low-interest rates for as far as the eye can see. The other is removing uncertainty. Now the market no longer needs to worry about Taper since we know exactly what the game plan is. The interest rate justification is a bit fishy since the Fed has long promised to keep interest rates near zero. The other thing is this move is through conventional means that mostly affect short-term interest rates. Long-term interest rates will largely be set by the market once the Fed’s bond buying program winds down. The one potential concern for the market is a material portion of this rally’s success stems from companies buying stock financed through ultra cheap bond issuances. With increased interest rates on the long end of the curve, companies are less likely to continue buying their stock at the same rates. Without a doubt actual volatility is ramping up as we keep whipping between 1,780 and 1,810 over the last several weeks, but implied volatility tanked today as demand for options plunged due to today’s strength and the elimination of uncertainty surrounding Taper. A potential red flag is volatility typically increases at market tops due to the messy power transition between bulls and bears. While I still don’t trust this market, today’s strength in the face of what should have been a selloff shows this market is standing on firm footing. Sentiment cannot remain at current levels indefinitely, but so far owners refuse to sell their stocks no matter what the headline. This confidence keeps supply tight and supports prices. While today was not the day the market resets sentiment to more sustainable levels, that day is coming and we need to tread lightly. The safer the market feels, the more dangerous it is. If the market adds to gains tomorrow, a trader can buy with a stop at 1,810 and cost into year-end. Those that are already in the market need to grow increasingly cautious and protective of recent gains. Move up your trailing stops up and remember, the more comfortable you are with your positions, the more nervous you should be. It is tough to be short given this market’s resilience, but the most bold can short this strength if we fail to add to today’s gains on Thursday. Use a stop above Wednesday’s highs. AAPL didn’t participate in today’s rebound because China Mobile has not announced the iPhone yet. Best guess is they are trying to extract better pricing from AAPL. If China Mobile wins concessions from AAPL, that likely means other carriers will follow. A couple of years ago AAPL was in the driver’s seat when it had the only smart phone people wanted. But with Android clones dominating market, AAPL is in a weaker position and phone companies will likely pressure AAPL’s revenues, margins, and earnings. Stocks are modestly lower ahead of the widely anticipated Fed’s policy statement. 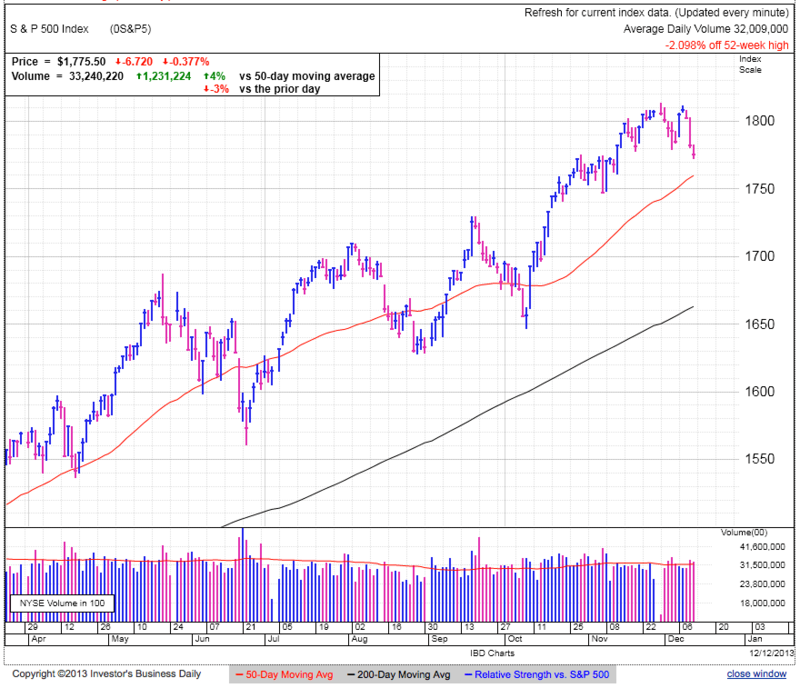 The market is near the lower end of the 1,780 to 1,810 range, while the 50dma is rapidly catching up during this month-long consolidation. Beyond the moving average, the next level of support is 1,750. Currently the market is consolidating recent gains, but we need watch out for the next directional move, either a breakout or a breakdown. Next week is Christmas and we have New Year’s the following week. If the market holds current levels following the Fed , expect it to coast into year-end on the typical light holiday trade. Buy the rumor, sell the news, or sell the rumor, buy the news? Both sides are jockeying ahead of the Taper/no-Taper decision, but since the market is forward-looking, what the Fed does today is less important than what it signals it will do in the future. At this point today’s Taper/no-Taper is a coin-flip, but most are confident the Fed will come out with more hawkish language that implies the Fed will start winding down monetary stimulus in the near future. While bulls could get no-Taper today, if the Fed puts in firm language, the market might respond to those forward-looking statements and actually sell no-Taper. Of course another view is much of this has been dissected to death over recent weeks and the market might coast through this policy statement because it is already priced in. In that case not much will happen. Taper is coming, if not today, soon. While it won’t be a big deal for the economy, markets and reality rarely intersect. This is a game of perception and the only thing that matters is what other people think. If the start of taper fills them with fear and they sell stock at a steep discount, the market will crash. Given the widespread bullishness reported by many sources, there are plenty of confident holders that can be convert into fearful sellers. 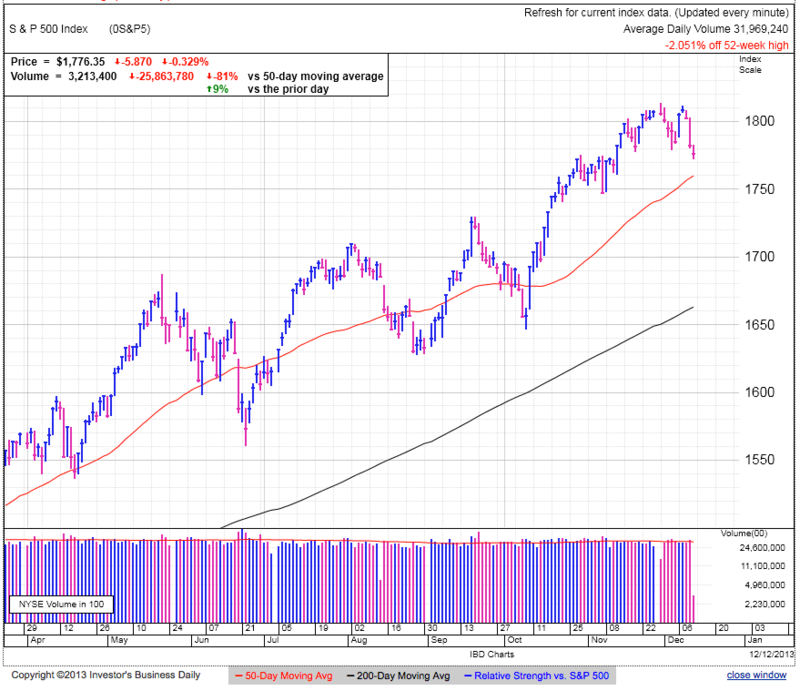 If the market falls on Taper, it is simply creating another dip buying opportunity. The best profit opportunities arise when others are reluctant and fearful, not when the crowd expects good times as far as the eye can see. Recent weakness tempted many bears to short this market. A surge to new highs will be fueled by these shorts forced to buy back the market as it rolls over them. Only price pays and it really doesn’t matter how sustainable a move higher is, only that is going up. Expect near-term volatility as news-driven traders jump all over the Taper/no-Taper. In the past the knee-jerk reaction was often a head fake and the market ultimately moved the other direction. Don’t buy the pop and don’t short the dip. Wait for market to calm down before trading the resulting move. Stocks gave up five-points Tuesday, failing to hold Monday’s rebound. The market briefly slipped under 1,780, but recovered this support level by midday. It is at the lower end of the recent 1,780 to 1,810 range. 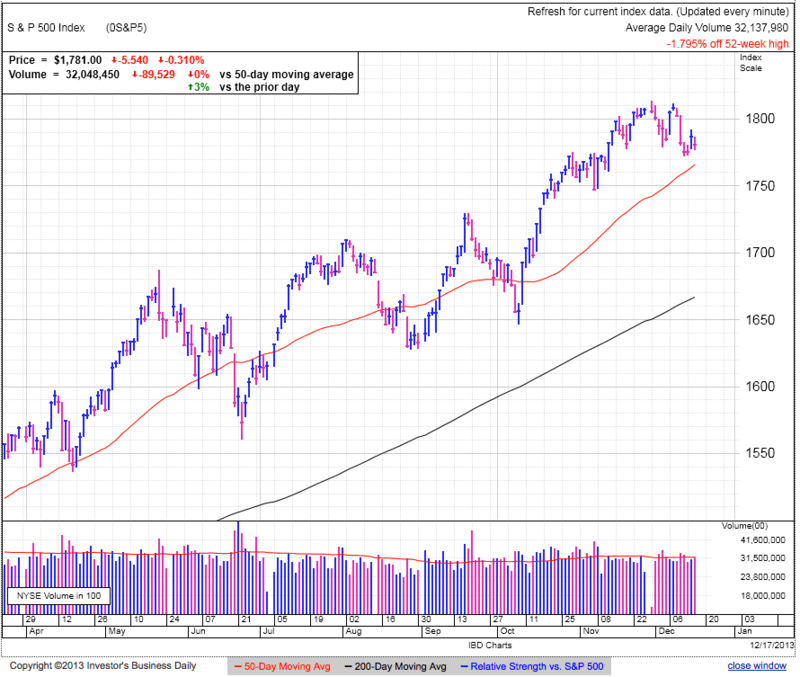 Falling under this level will likely lead to further selling, a test of the 50dma, and prior support at 1,750. If the market holds current levels through the end of this week, it will likely rally in the final weeks of the year. Fear Taper, hope for no-Taper, or don’t care. Those are the three attitudes the crowd can take toward the Fed’s policy statement. The reason we want to gauge sentiment is it is often profitable to take the other side of the trade. This isn’t because the crowd is “dumb money” but because the crowd’s opinion is already priced in and supply and demand dictates the market will do something else. If the crowd fears Taper, it will come into the policy statement underweight so it won’t be hurt by the anticipated selloff. That means most of the selling already happened, making it far easier for the market to rally on the news. If it hopes for no-Taper, it is holding through recent weakness, expecting the Fed’s non-move will lead to yet another surge in prices. But since most already own stocks coming into the event, there are few left to buy the news and that lack of demand makes it harder to support current levels. And finally, if few change their mind based on the Fed statement, the crowd will maintain current positions and the lack of trade will keep up the status quo. Since there is little fear in the market, it doesn’t seem like the market sold ahead of Wednesday’s policy statement Without an ample supply of underweight traders to buy the news, it is unlikely we will get a no-Taper pop we’ve seen following past meetings. And since so few people sold ahead of time, that leaves a large supply of optimistic owners that could easily become nervous sellers. A month of sideways trade saw cautious owners lock in profits bears lay on short positions. These traders are ready-made buyers if the Fed forces them to chase a surge higher. Given bullish sentiment and proximity to all-time highs, the potential for an explosive move higher is limited. On the other hand, given those same conditions, we are vulnerable to a material selloff if confident owners become fearful sellers. Nothing shatters confidence like seeing everyone else rush for the exits. While the high probability is sticking with the up-trend, the potential for a larger move is to the downside. How a person trades this setup is up to their style, risk appetite, and trading plan. AAPL bulls got an early Christmas present with the China Mobile announcement, but the stock is surprisingly down on the news. It seems like everyone widely expected it and there was no one left to buy the news. Now that all the positive catalysts of product refreshes, buybacks, dividend increases, and China Mobile are behind us, what is left to convince people to bid up the stock? If the story returns to decreasing profits, margins, and market share, this might be a good time to lock in recent profits and wait to buy the stock back at lower levels. Stocks gave up yesterday’s opening gap, briefly falling under 1,780 support. Monday was the bounce bulls and dip-buyers were hoping for, but they were never able to build on early momentum. Almost all of the buyable dips this year accelerated following the bounce. This stalling likely indicates this is not the real buyable bottom. All eyes are on the two-day Fed meeting, but will the outcome change anyone’s mind? Will it turn bears into bulls, or bulls into bears? The only thing that moves prices is when market participants change their mind and alter their portfolio allocations. That resulting buying and selling is what moves markets. 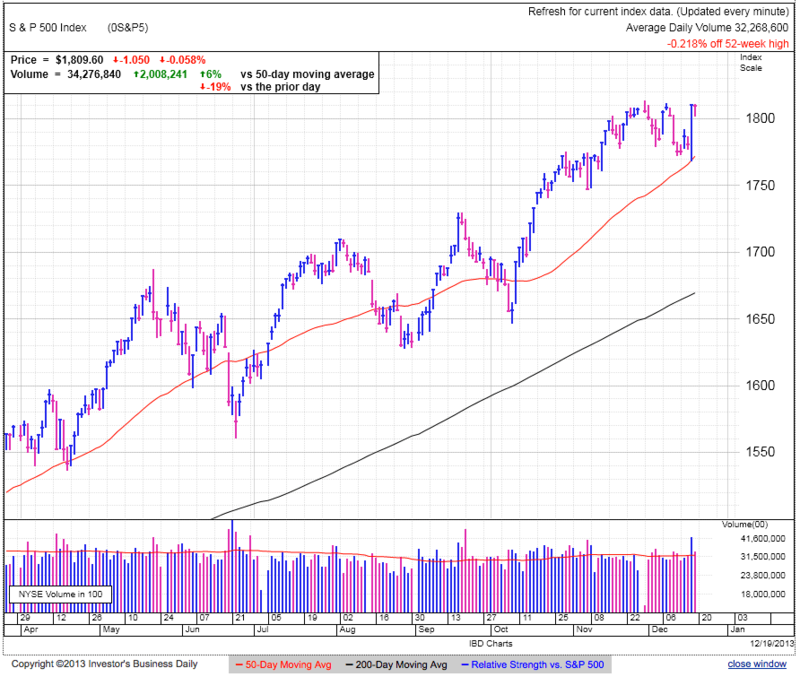 Will Taper turn bulls into bears? Will no-Taper turn bears into bulls? No doubt we will see near-term volatility as short-term traders try to game the headlines coming out of the FOMC meeting tomorrow, but after that passes, expect the market to return to its previous trajectory. Since the Thanksgiving high, buying stalled as few are enthusiastically buying these new highs. The last couple months has seen a dramatic shift from 20% bulls to 60% bulls. Converting cynics into buyers fueled the 150-point surge off the October lows, but with so few cynics left to convert, we might be running into demand problems. The challenge for bulls is yesterday’s pop pulled a portion of the no-Taper buying forward, meaning there will be fewer left to buy the news when it comes out Wednesday. Today’s weakness shows many are not willing to follow the dip-buyer into this trade. Maybe they don’t believe it, or maybe they are already in the trade and don’t have extra money to buy more. The challenge is when so many people already believe in a move, there are few left to keep pushing prices higher. The last few weeks of churn removed some of the market’s recent excess, setting the stage for a continuation. Sentiment can remain at bullish extremes for extended periods of time and is a secondary indicator. 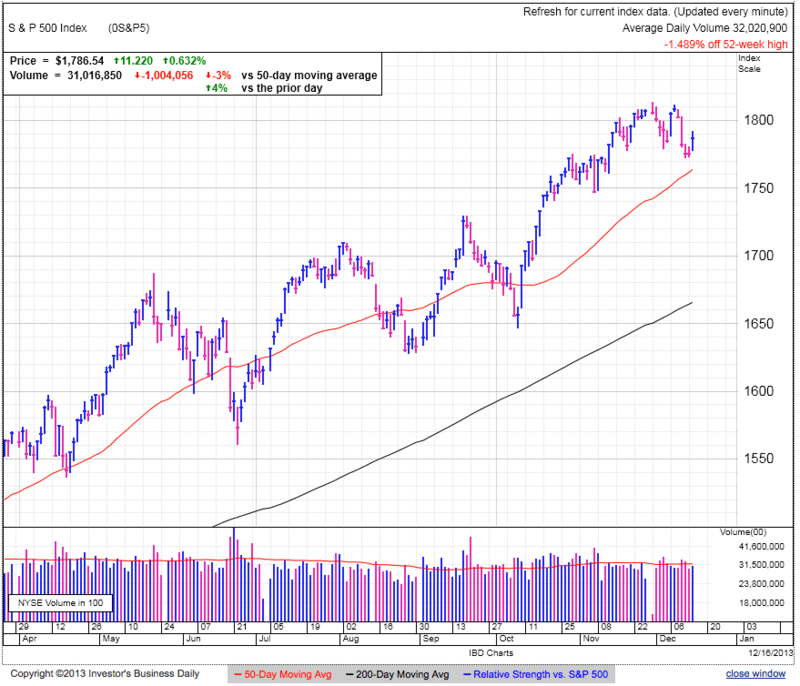 When in doubt stick with the trend and in spite of modest weakness, the market is still in an uptrend. Now we simply wait and see what the Fed has to say and trade the resulting move. Given the high level of bullishness already in the market, there is not a lot of explosive upside in the market. On the other hand, we are vulnerable to a herd selloff if the crowd loses its nerve. While the high probability trade might be higher, the bigger move potential is lower. Trade those conditions according to your style, risk tolerance, and plan. Stocks reclaimed 1,780 in early trade and held this level through the close. Volume was higher than Friday, but still below average. 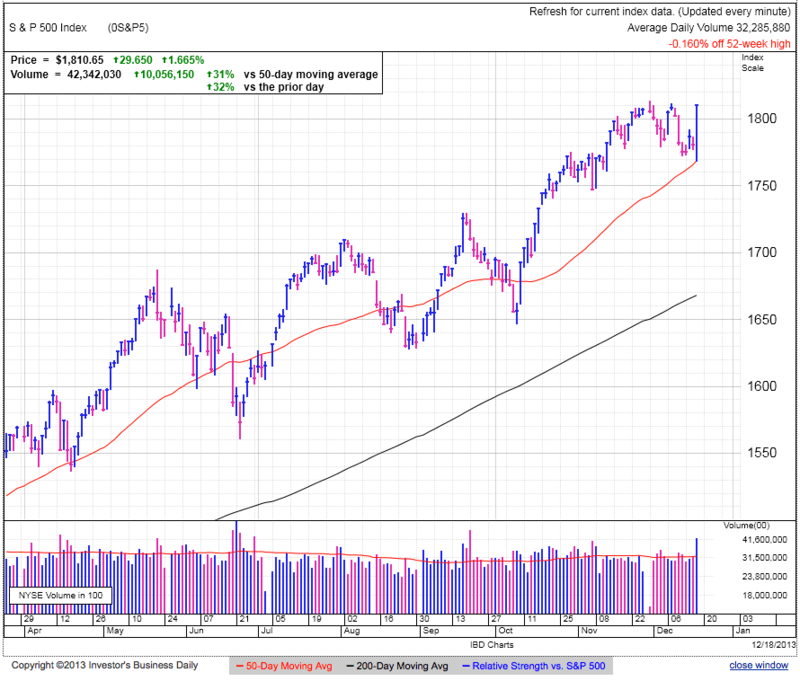 The market is inside of the 1,780 to 1,810 trading range still holding above the 50dma. The talking heads are going round and round over whether the Fed will announce a reduction in QE on Wednesday. Some say yes, most say no, but the consensus is the Fed will come out with strong language preparing the market for a slow withdrawal of fiscal stimulus in coming months. Today’s rebound started strong, but failed to add to early gains and settled 5-point off the early highs. Many traders are simply waiting for the Fed’s policy statement before adjusting their positions. No doubt if there is a post-Fed pop, today’s strength brought some of that buying forward and makes an explosive move higher less likely. The market remains in no man’s land, stuck between,780 to 1,810. At this point it is a coin-flip if we get Taper. The consensus seems to expect no Taper, so it is likely priced in. We could get a short-lived bounce as news driven traders chase the move, but expect the market to quickly return the previous state. Over the last couple weeks, the market has a couple lower-lows and lower-highs following the Thanksgiving all-time high. Since then traders have been reluctant to buy near the highs and the market drifted lower on light demand. (heavy selling is accompanied by above average volume) Unless the market is shocked by good news out of the Fed, expect the light-volume drift lower to continue after the Fed induced volatility passes. 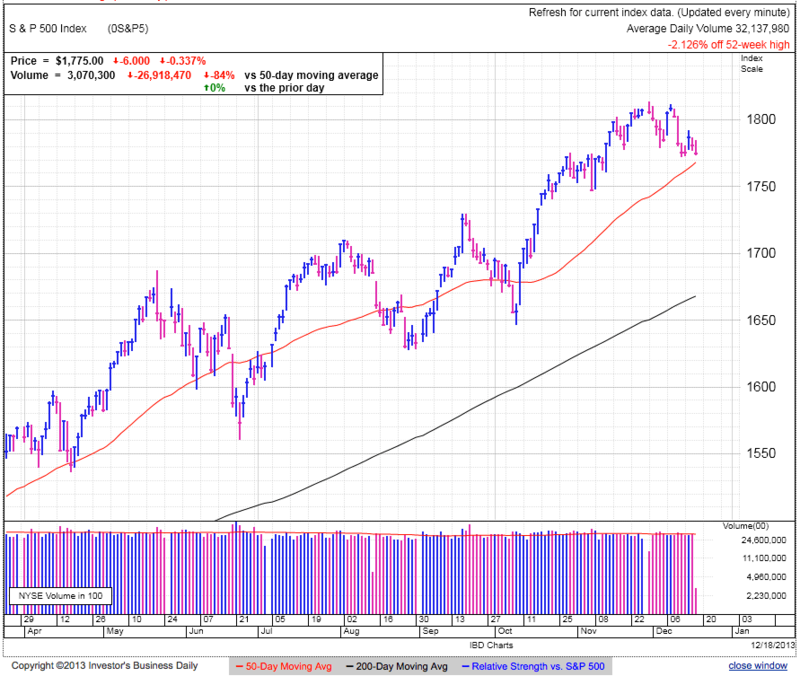 The market made it most of the way to the 50dma and often we don’t need more than that before refreshing the rally. Without a scary headline, holders don’t have a reason to sell and are happy to own stock at these levels. As long as they refuse to sell into weakness, supply will remain tight and it will be easy for the market to bounce on modest demand. So close to the Fed statement, it is a bit late to put on a trade. It is a binary trade and little more than a coin-flip, so the conservative approach is to trade the resulting move. The most likely outcome seems to be an initial pop as the Fed kicks the can down the road, followed by weakness as most already expected this move and bought in anticipation. Failing to hold 1,780 is sortable and surging above 1,800 is buyable. Stocks ran up on the heels of the European market’s strength. 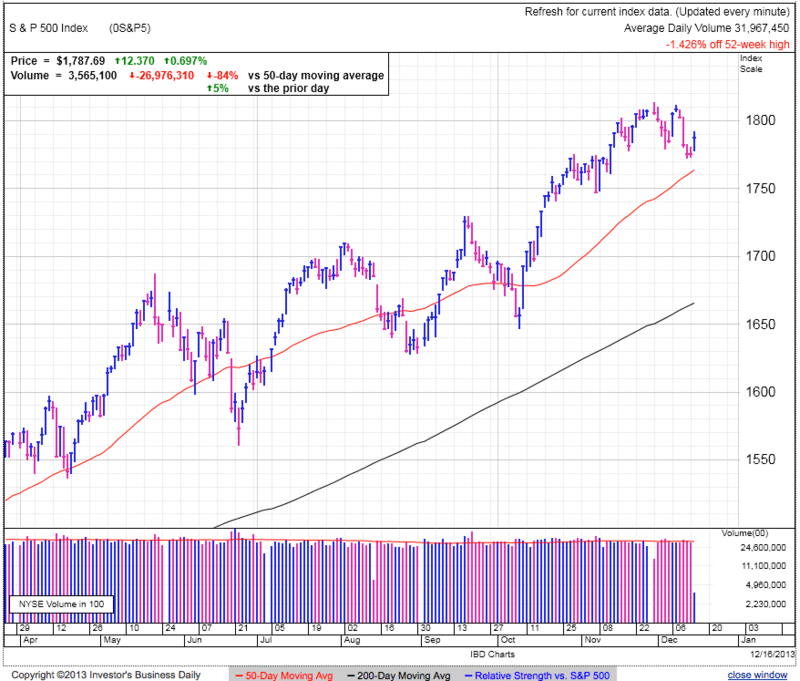 We reclaimed prior support at 1,780 and traded as high as 1,790, but the market slipped midday as buying paused. This was the bounce bulls were waiting for. The Fed’s meeting starts tomorrow and some of this buying is in anticipation of the “No Taper” surge to new highs. But if excited bulls are buying the rumor, how many will be left to buy the news? While everyone is debating “to Taper or not to Taper”, we should really be asking if it matters. Given the trillions of dollars in bonds the Fed already owns, will dialing it back by $10 billion really make much of a difference to either the Fed’s balance sheet or the broader economy? Yet it is all anyone is talking about. The bulk of the debate revolves around taper now or early next year. Again, this is a relatively small numbers and it won’t make much difference either way, but markets trade emotion, not common sense. While the economic nuances of Taper policy don’t matter that much, the crowd’s reaction is what we are trying to anticipate. Whether they Taper this week or hold off a month or two, there is a lot of pressure on the Fed to dial back its monetary intervention, both externally and internally. Even if the Fed delays Taper, expect the language to firm up as the Fed prepares the market for the inevitable withdrawal of QE. Bulls might get the “No Taper” they are hoping for, but if the language is hawkish, that could temper enthusiasm. Markets remain more bullish than they’ve been in years. While this condition can persist for an extended period of time, it is riskier to own stocks here than at any other point in the last two years. Since no one knows for sure what the future holds, the best we can do is play the odds and anyone buying this rally is late to the party. The best buying opportunities arise when everyone is nervous and fearful. That is clearly not the case here as the crowd widely expects the good times to continue. While Taper/No-Taper is a coin-flip at this point, we need to evaluate the potential moves in either direction before deciding how to trade. The market is only 1.5% off all-time highs and 7% above the 200dma. Given the strong run and the already bullish sentiment, it is hard to imagine a huge upside surprise given how much optimism is already priced in. On the other hand, markets go up and markets go down. It’s a year since we last tested the 200dma and it wouldn’t take much of a headline to trip up the market given current expectations. The sideways churn between 1,780 and 1,810 saw a lot of owners move to cash. While not a dramatic move lower, holding these levels for a few weeks allows the market to cool off, making another leg higher more sustainable. The market is in the middle of the recent trading range ahead of the Fed meeting and there is not a lot to do here other than wait for the market to show its hand. Dipping under the 50dma in coming days is clearly bearish and launching through 1,800 is bullish. Until then we are all spectators. I have a bearish bias given the bullish shift in sentiment, but this could go either way. Stocks slipped for a third straight day, undercutting recent support at 1,780. 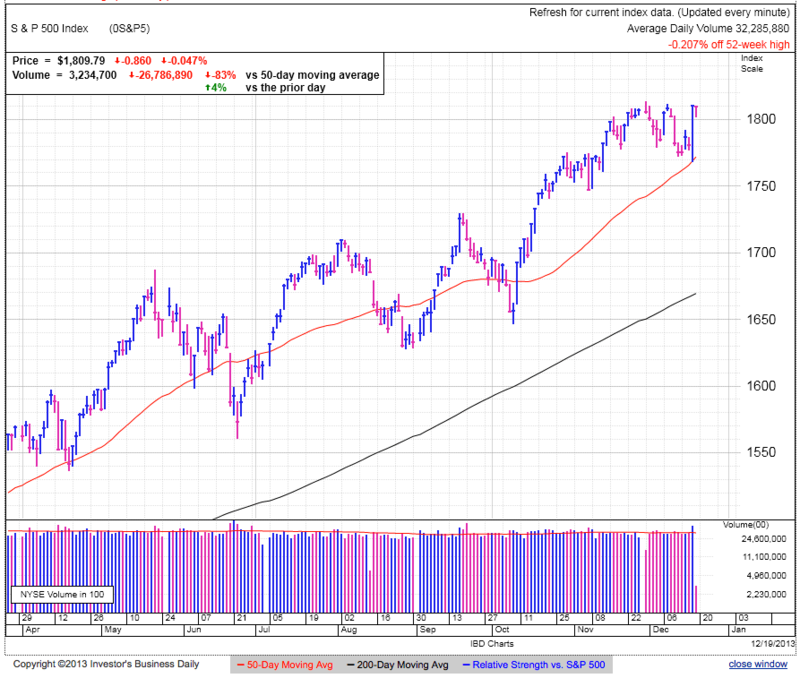 The next technical level is 1,760 and the 50dma. Volume was surprisingly light for a second day as a wave of fear and panic selling failed to hit the market. While this orderly selling can be bullish because it shows most holders are confident and unwilling to sell modest weakness, it also means there is a huge amount of potential selling still hanging over the market if fear and panic take hold. Since trading volume is near average, it shows sellers are not showing up in droves and this weakness is primarily caused by a lack of demand as dip buyers remain MIA. Is this because they are waiting for more attractive prices, or more worrisome, we are running out of new buyers willing to prop up the market near all-time highs. 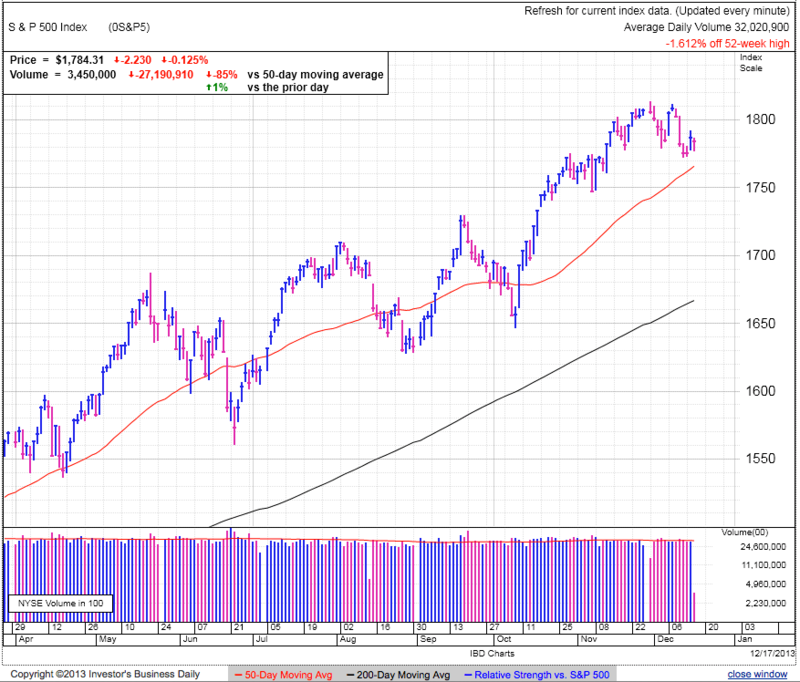 At this point the near-term trend is down since we were unable to hold support at 1,800 Wednesday and 1,780 Thursday. Low-volume selling indicates we are nowhere near capitulation and there is plenty of downside potential if the herd gets spooked and rushes for the exits. The next level to watch is 1,760 and the 50dma. Where we go from there largely depends on how emotional traders become. If they remain calm and collected, expect more selling. This market is stalling on over bullishness and we need to reset sentiment before the rally can resume. This dip will bounce at some point because they always do, the only debate is how low we go first. We’ve seen a lot of distribution over the last three weeks with 12 of the last 18 days finishing in the red. Anyone selling at the top has plenty of cash to buy the dip when it reaches an attractive level. Recently we have been bouncing sooner and sooner and could very well could be on the verge of yet another rebound to new highs. The key is reclaiming support at 1,780 and 1,800. With the market so perfectly setup to selloff, if bears cannot get the job done, they show they are powerless to hold this rally back. The new lines in the sand are 1,780 above and 1,760 below. Reclaiming 1,780 shows buyers are finally stepping up to defend this rally. Falling under 1,760 could finally trigger that high-volume wave of capitulation selling as confident owners turn into fearful sellers. So far nothing indicates this move is more than a routine pullback to support, but given how much potential selling is still out there, things could get ugly in a hurry if fear takes over. Stocks slipped for a second day, undercutting support at 1,780. If today’s losses hold, that makes eight out of the last ten sessions ending the red, a dramatic reversal from all the buying we’ve seen in recent months. The next material level of support is 1,760 and the 50dma. While we’ve held near all-time highs in recent weeks, there was a clear undercurrent of distribution taking place under our noses. Eight of the last ten and twelve out of the last eighteen sessions finished lower. The losses have been so minor that bulls could easily ignore the distribution, but violating support this morning makes this phenomena harder to hide from. Dip buyers remain MIA. Wednesday they failed to defend 1,800 and today they allowed us to slip through 1,780. The saving grace is today’s violation of 1,780 didn’t trigger a free fall selloff as many owners chose to wait for the “inevitable” bounce rather than sell a dip under some “arbitrary” technical level. And this isn’t surprising. Every other bout of weakness this year ended in a powerful rebound to new highs and regretful sellers learned to be more patient next time. While this strategy worked every other time this year, we inevitably come to a dip that doesn’t bounce. It is too early to say this is the end, but the lack of urgent selling likely means we haven’t hit bottom yet. The crowd was wrong about “Sell in May” and they avoided September and October because that’s when markets crash. But now they are waiting for the Santa Clause rally. Will conventional wisdom end the year oh and three? If the success in the market was as simple as following a few catchy phrases, preschoolers could beat the market. Dip buyers need to come in and prop up the market, until then assume buyers are scarce and selling will continue. The best time to buy is when everyone else is convinced we are headed lower. Violating support this morning flushed out anyone with stop-losses. Once that selling runs its course, supply will dry up and we will bounce yet again. Stick with what is working. The market is selling off without urgency and these things typically end on an emotional climax, something we have not reached yet. Bullishness it near historic highs and we need a dramatic move to reset sentiment to more sustainable levels. While we will eventually reach a buyable bottom, there is no reason to buy prematurely. Wait for this move to run its course and buy the resulting strength.